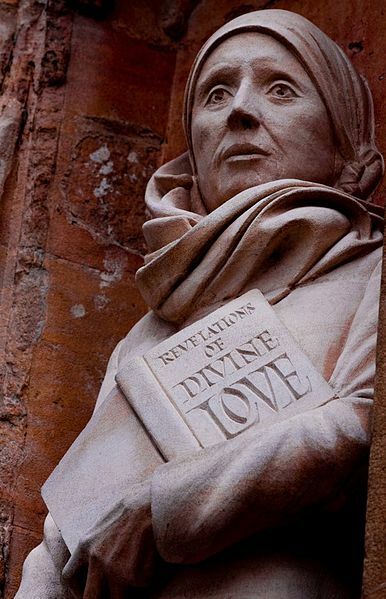 Julian of Norwich is a medieval English mystic who celebrated “Mother Jesus.” Her feast day (May 8) happens to fall on Mother’s Day this year. It’s not known if Julian herself was queer, but her ideas were. Julian is often listed with LGBT saints because of her genderbending visions of Jesus and God. Her visions of Jesus as a mother sound radical even now, more than 600 years later. In today’s understanding, Julian’s Jesus seems to be transgender! Her omnigendered vision of the Trinity fits with today’s feminist and queer theology. Julian (c.1342-1416) is the first woman to write a book in English. The book, “Revelations of Divine Love,” recounts a series of 16 visions that she experienced from May 8-13, 1373 during a severe illness when she was 30 years old. The book includes Julian’s most famous saying, “All shall be well and all shall be well and all manner of things shall be well” -- words spoken to her by God in one of Julian’s visions. Later Julian went on to become an anchoress, a type of recluse who lives in a cell attached to a church and does contemplative prayer. Her hermit’s cell was at the Church of St. Julian in Norwich. It had two windows, one opening to the church and the other opening to the street. She became known throughout England for the spiritual counseling that she gave there. Julian is considered the first Catholic to write at length about the motherhood of God. Her profound ideas about God as mother speak powerfully today to women and queer people of faith. “As truly as God is our Father, so truly is God our Mother,” Julian wrote. The sacred feminine is just one of the many revelations that have endeared Julian to the public. She uses objects from ordinary life to illustrate God’s loving, forgiving nature. For example, in one vision God shows Julian a small object like a hazel-nut in the palm of her hand. In the icon at the top of this post, Julian looks out the window of her cell with her beloved cat. As an anchoress she probably lived alone. The only other being said to share her room was a cat -- for the practical purpose of keeping it free from rats and mice. A longstanding legend tells of Julian’s friendship with her cat companion. Julian lived a long life. The date of her death is unknown, but records show that she was still alive at age 73 to receive an inheritance. She was never formally canonized, but Julian is considered a saint by popular devotion. The Episcopal and Lutheran Churches keep her feast day on May 8. This post is part of the GLBT Saints series at the Jesus in Love Blog. Saints, martyrs, heroes and holy people of special interest to gay, lesbian, bisexual and transgender (GLBT) people and our allies are covered on appropriate dates throughout the year. Just wondering if your wonderful imagery of Jesus "nursing" human souls came from any previous study of Julian's ideas? I had been aware of the concept of Christa, the feminine nature of the WORD, as well as the feminine Sophia for Divine Wisdom or the Holy Spirit. However, your visualization of Jesus nurturing human souls in this way even before his death and resurrection was a brand new concept for me when I first read Jesus in Love, and it opened whole new vistas of understanding and intimacy. I am delighted to see this post about Julian of Norwich. But I want to point you to a translation far superior to those you cite: It's by Fr. John-Julian, OJN, founder of an Episcopal monastery in Wisconsin on Julian principles. Two things make his "Revelations of Divine Love" a superior translation: he translates with a mystical faith based on her own, which opens up many spiritual insights unavailable to the academic translators you cite. Nobody can comprehend Julian without sharing her faith in Jesus Christ - which those medieval specialists lack. Their interest (not to disparage it) is in understanding her medieval context, more than her faith. "First woman to write a book in English," after all; but what she really discovered rather eludes them. You'd do very well to add an Amazon link to Fr. JJ's translation. Unlike the other translators, he's Gay. So you can imagine how that might open up insights in the hands of a scholar. Second, his format is superior. He renders Julian in small daily chunks, just a page or two. That's plenty to meditate on for the average Christian; the woman was richly endowed by God, and just as you say, her insights were astounding even to present minds. And she discovered this stuff 800 years ago!!! I once podcast Fr. JJ's translation in those same little pieces for the 40 days of Lent, with his permission. Attendance soared. I urge you, reverend mother, to continue in this vein. You have done well here; now grow and expand! I just happen to think Fr. JJ, following Julian, is the coolest thing in pants. Yes indeed, Trudie, I was influenced by Julian of Norwich when I wrote about Jesus “nursing” human souls in my “Jesus in Love” novels. When I first read her “Revelations” many years ago I was amazed by her concept of Jesus as a nursing mother, as quoted in this post. That idea percolated in my heart and soul, later to emerge in my novels. Thank you, Josh, for calling our attention to a good translation of Julian’s “Revelations.” I have added a link to the Fr. John-Julian translation that you recommend. I did a quick comparison of some short passages using the “look inside this book” feature at Amazon, and his translation seemed pretty similar to the versions already posted, but you make a convincing argument in favor of Fr. John-Julian’s version. I also enjoyed learning about the Order of Julian of Norwich, which he founded. There are many translations of “Revelations,” and I didn’t have time to compare the pros and cons of the various versions for this post. I personally own the Wolters translation and can confirm that Julian’s spiritual insights come shining through, even if the translator comes from a more scholarly, heterosexual perspective. Does anyone else have a favorite translation to recommend? I’ve been amazed at the popularity of this post about Julian and Mother Jesus. It has already been shared on Facebook 45 times! Thanks, everyone, for sharing Julian’s story. Mother’s Day began in North America with a proclamation for peace in 1870 by Julia Ward Howe. She wrote “Battle Hymn of the Republic” 12 years earlier, but the horrors of the Civil War convinced her to issue this call for peace and disarmament. Just a passing comment -- I'm delighted that Robert Lentz's icon shows Julian with a cat companion. I'm always looking for examples that I'm not the only one who shares contemplative moments with my feline companions. 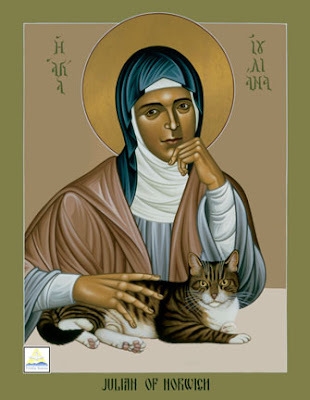 Robert Lentz painted another icon of Julian of Norwich where she is holding the universe instead of a cat (based on her hazel nut vision). But, like you Trudie, I was drawn to the picture of the cat. I want you to know that every single LGBTQI young person I encounter, and I encountter quite a few, particularly from India and The Middle East, who is struggling with reconciling their sexual selves with their spiritual selves, are guided to this blog by me and specifically to this series. It makes absolutely no difference what their spiritual orientation is. In fact, right at this very moment, I have a backlog of several people who have recently friended me on facebook because of my unabashed melding of sexual and spiritual imagery, who I need to direct to "Jesus in Love." This is a huge service you are providing to the world. I am so grateful for it and for you. Om Shanti Shalom! Sage, everybody that you send here is very welcome! What a wonderful comment! Thank you for guiding them to the Jesus in Love Blog, and for letting me know that my work here is making a positive impact on you and others. I make a conscious effort to make this blog welcoming to people of all faith traditions, so I am glad that to hear that it is indeed speaking to people of various “spiritual orientations,” as you put it. I understand that India and the Middle East may not have as many resources about uniting sexuality and spirituality, so I’m glad that you are reaching out to so many young people there. Lately I’ve been hearing from people in Russia and Eastern Europe with similar needs. Hunky Jesus contest: Liberating or offensive?